Lima Noon Optimist Bill Lewis kicks off the 2018 Toys For Tots campaign with the Salvation Army during their luncheon at the Elks Club on Wednesday. LIMA — The Salvation Army, Lima Noon Optimist Club and the United States Marine Corps have officially started the annual Toys for Tots campaign, an initiative that brings hope to children’s lives across Allen County, said Salvation Army Maj. Debbie Stacy. For more than 60 years, the Toys for Tots campaign has collected new, unwrapped toys, books and essential items and donated them to families in need during the Christmas season. On Wednesday, members from each of the participating organizations gathered at the Elks Club to kick off the campaign. Last year, Toys for Tots delivered $45,000 worth of toys to over 17,000 kids across Allen County. This year, there are 179 drop off locations throughout Lima. The campaign will officially end Dec. 10. 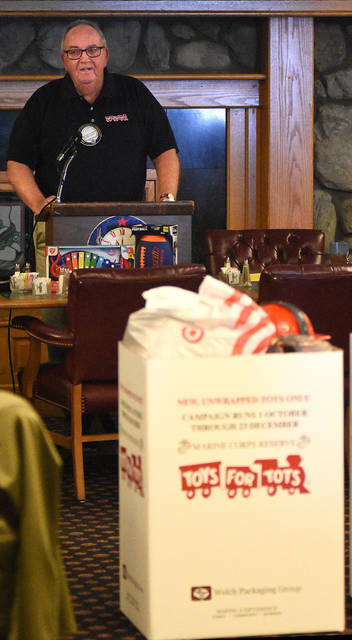 “This [campaign] is an encouragement for the entire Lima community to continue this tradition of generosity and selflessness,” said Lima Mayor David Berger during his annual Toys for Tots proclamation. Salvation Army Lt. Georges Junie Neillard said she is proud to be a part of the Salvation Army and the Toys for Tots campaign because she is blessed to give back to the community. Although the Toys for Tots campaign has successfully donated hundreds of toys to children and families in need every year, the Salvation Army has been faced with several challenges this year, said Stacy. The Toys for Tots campaign was also affected by store closings like Toys R Us, which was a store that donated every year. Also this year, local merchants have limited their toy boxes or have even cancelled boxes, said Stacy. For more information regarding drop off locations or how to donate, contact The Lima Noon Optimist Club at info@limaoptimist.com or visit the website at http://limaoptimist.com.